Cugny is a village in the department of Aisne, some 30 kilometres south-west of St Quentin on the D937. When passing through the village there is a large crucifix at the edge of the road, take the small road opposite this and then the first track on the right which leads to the cemetery. On entering the cemetery, turn immediately right and the war graves will be found at the rear of the cemetery on your right. There is 1 unidentified burial of the 1914-1918 war and 7 of the 1939-1945 war here. Incident: Crashed at Cugny, Aisne on 9th Aug. 1944. 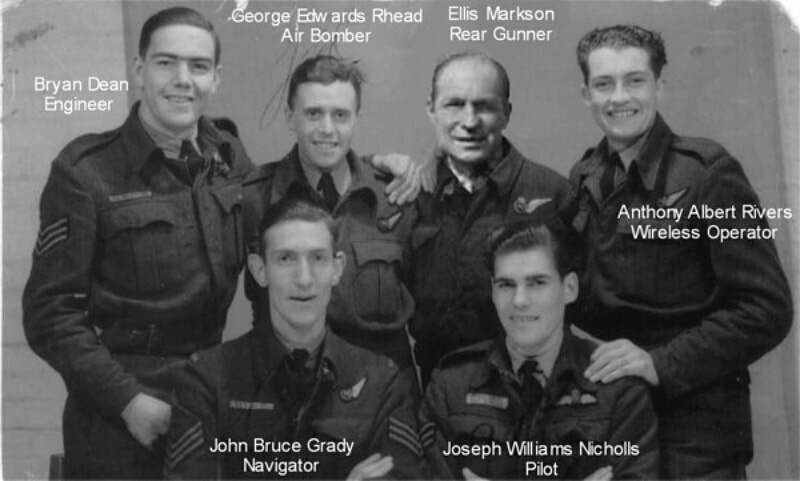 Six of the seven members of the crew killed at Cugny 9th August 1944. 1896765 Sergeant Clifford George Bragg, Air Gunner in 161 Squadron, Royal Air Force Volunteer Reserve, died 9th August 1944, aged 20. Son of Clifford and Florence Lily Bragg of Kingsbury, Middlesex. INSCRIPTION. SO YOUNG TO DIE. RESTING SO FAR AWAY. SADLY MISSED BY HIS SORROWING FAMILY. 1892263 Sergeant Bryan Charles Frederick Dean, Flight Engineer in Royal Air Force Voluntary Reserve, died 9th August 1944, aged 27. Son of Frederick Bryan and Gertrude Mary Dean of West Norwood, Surrey; husband of Josehine Anita Dean of Hamton, Middlesex. INSCRIPTION. TO LOSE A VERY PRECIOUS TREASURE IS GRIEF WITHOUT MEASURE". J/89985 Pilot Officer John Bruce Grady, Navigator in 161 Squadron, Royal Canadian Air Force, attached to Royal Air Force, died 9th August 1944, aged 26. Son of John Earle and Mary Lulu Grady of Hamilton, Ontario, Canada. INSCRIPTION. HIS COUNTRY CALLED; HE HEARD AND OBEYED. 2211419 Sergeant Ellis Markson, Air Gunner in Royal Air Force Volunteer Reserve, died 9th August 1944, aged 38. Son of David and Sarah Markson; husband of Ethel Markson of Liverpool. 1576493 Flight Sergeant Joseph William Nicholls, Pilot in 161 Squadron, Royal Air Force Volunteer Reserve, 9th August 1944. 54696 Pilot Officer George Edwards Rhead, Air Bomber in 161 Squadron, Royal Air Force, died 9th August 1944, aged 38. Son of George and Mary Rhead; husband of Phyllis Rhead of Stockcross, Berkshire. INSCRIPTION. UNDERNEATH ARE THE EVERLASTING ARMS". 1389036 Sergeant Anthony Albert Rivers, Wireless Operator in 161 Squadron, Royal Air Force Volunteer Reserve, died 9th August 1944. (Picture courtesy of nephew, John Grady). (Picture courtesy of sister Leslie Petrocelli and niece Fiona Petrocelli).